Two Way All Day Barrie Corridor Upgrades - Strasman Architects Inc. 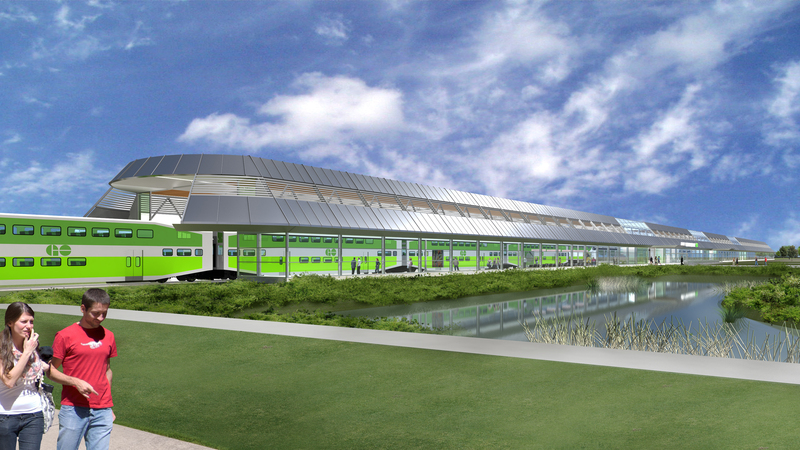 The architectural assignment was to assist Cole Engineering in examining alternative options to the existing snow melting and clearing systems at six stations for the Two Way All Day Barrie Corridor Upgrade Project. 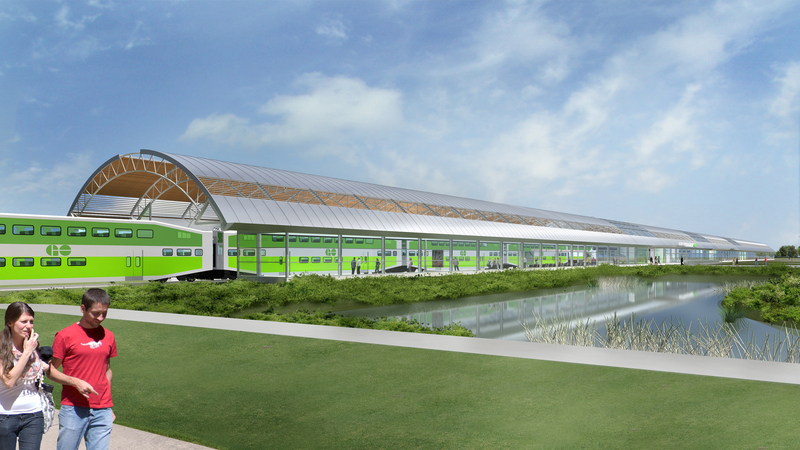 Traditionally Metrolinx had addressed snow melting by way of a glycol based hydronic snow melting system with boilers and primary and secondary circulating pumps housed in bunkers. Manifold chambers located on the platforms are used to distribute the piping. 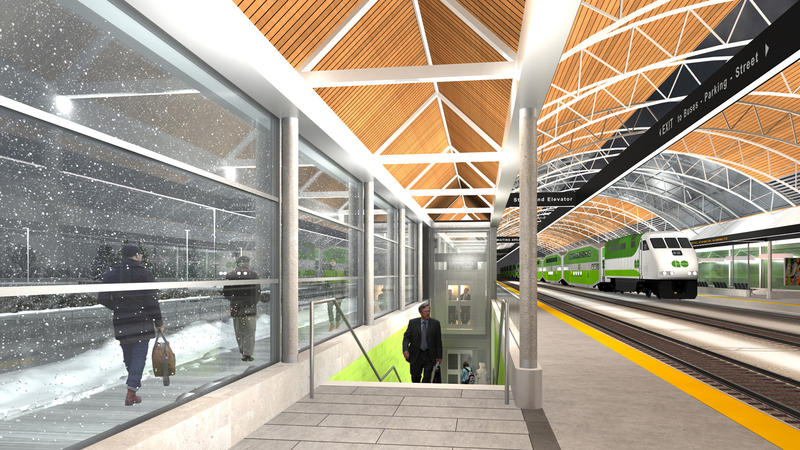 Wanting to change this approach to a more sustainable solution and at the same time improve space utilization, Metrolinx was willing to consider the possibility of replacing the snow melting system with a canopy system over the entire platform and tracks. 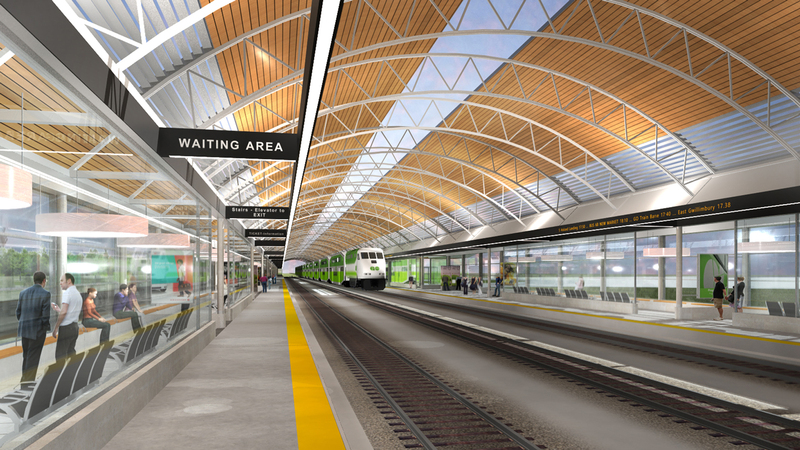 For this assignment, Strasman Architects Inc. developed a concept and feasibility study for installing a canopy system over the platforms and tracks that would work with the present diesel locomotives as well as any future electrified track. 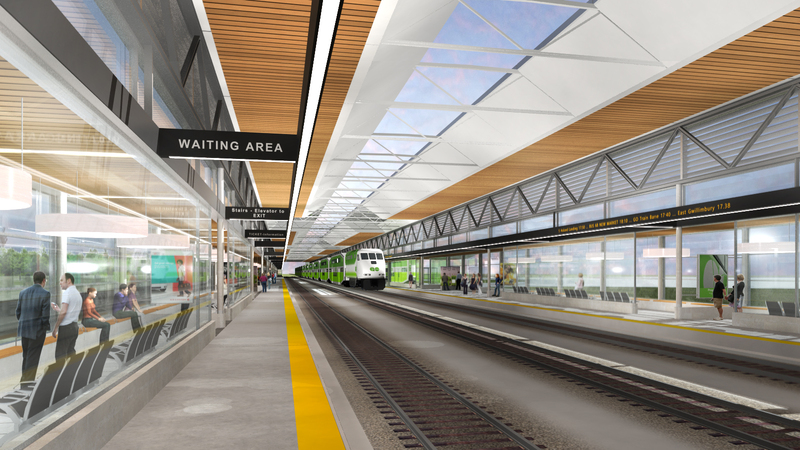 Two stations in particular were selected: Aurora for historical significance and East Gwillimbury as a more modern station. 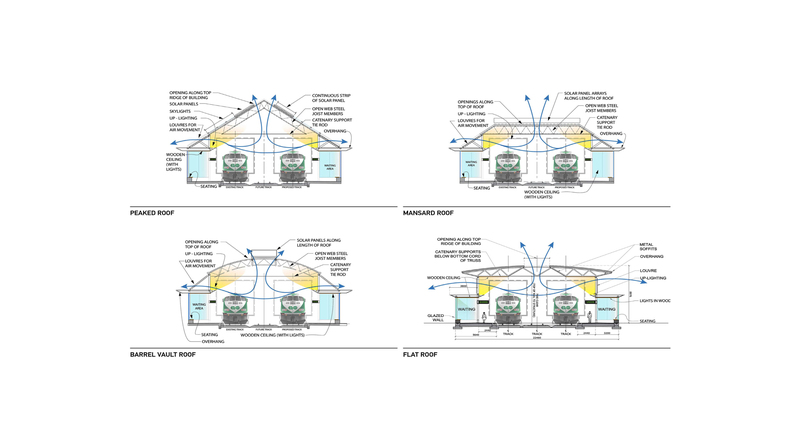 Our study explored in detail four roof options: barrel vault, peaked, Mansard and flat. Common elements for each included a band of louvers which separate the roof for the enclosing glass walls at platform level and the structural components. 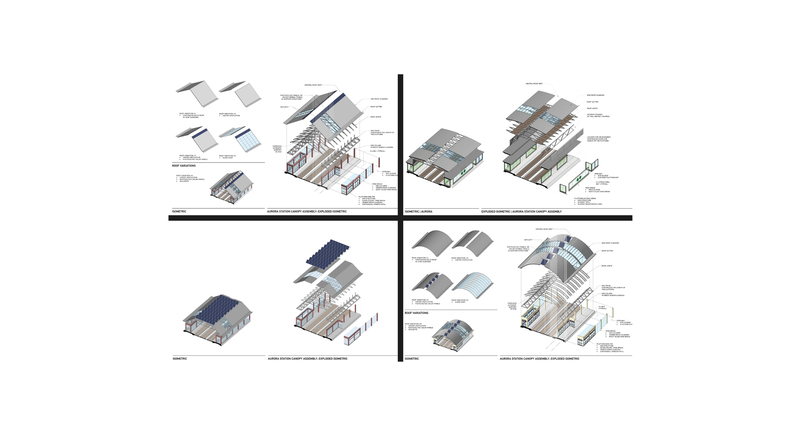 Each option could be further modified by varying amounts of glass, PV panels, solar panels and a myriad of roof finishes. 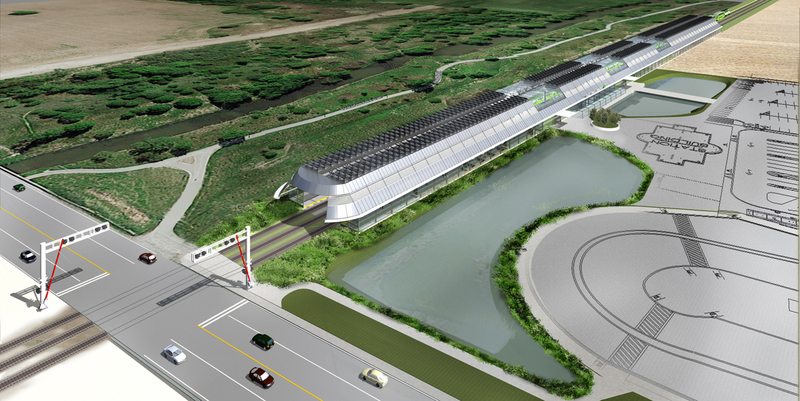 The idea of integrating the station and the platform with a parking structure was also explored. 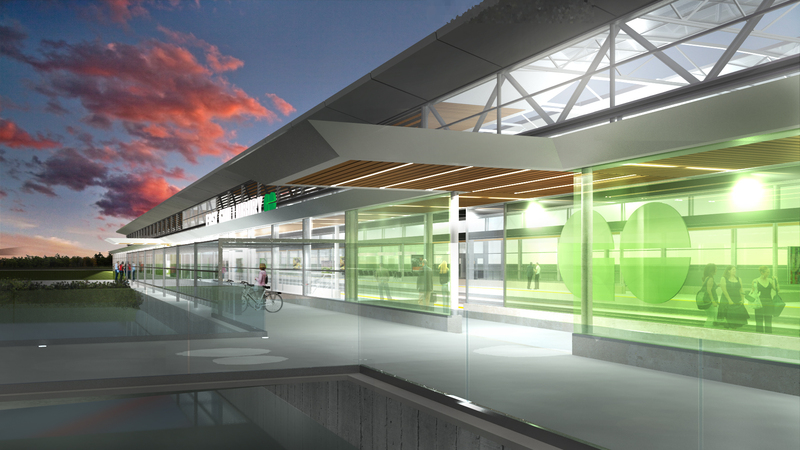 The strategy going forwards was to rely on the GO Metrolinx Brand Standards guidelines to form the foundation of an across the line design narrative. 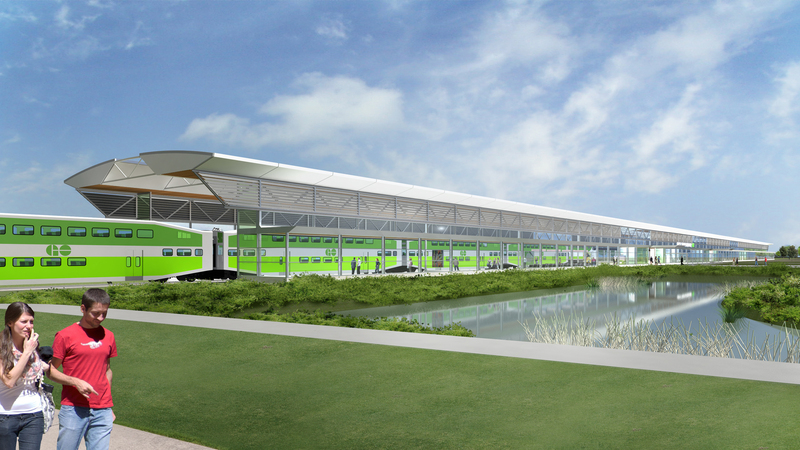 Each station site would be influenced by its context, the topography, the linkages and the assembly of common elements: roof, walls, structure, lighting, furniture, graphics, landscaping and colour, reinforcing and focusing on passenger comfort and convenience. Each station site would be distinct, and would be tied together by the overarching design narrative and a common materials palette. The roof form and finish will be a common and powerful across the line theme as well as the walls and structural expression.